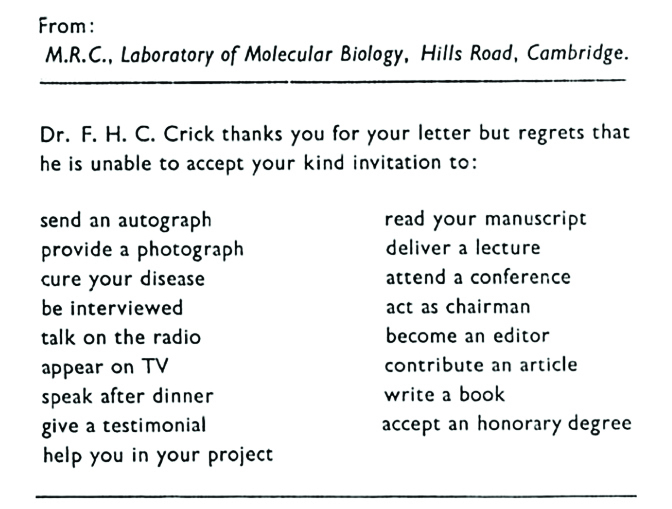 A response strategy [Francis] Crick adopted in the 1960s to cope with an enormous post and to make a serious point playfully was the occasional use of a pre-printed postcard offering a number of reply options. The seventeen listed (see Figure 3) are a faithful reflection of the requests he regularly received. Francis Crick's all-purpose reply card. While I don’t expect to have opportunity to use many of these myself in the future, and there are some that I don’t agree with rejecting outright (e.g. read your manuscript), this list serves as a checklist for non-core academic activities and a useful reminder of what we didn’t go into science for in the first place. 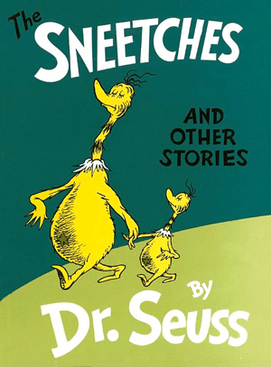 For the last two years, my lab has run a blog on issues relating to technical matters in bioinformatics and evolutionary biology. Increasingly, I have felt that there are issues that deserve to be commented on in science and society that go beyond this remit, and in order to separate my work and personal views I’ve decided to establish a new blog for these more opinionated posts. Posts with a timestamp earlier than this one are opinions migrated over from my work site. I also hope to get involved more in the Research Blogging network to share my views on interesting or controversial work being published in my area of expertise.